A few stunning images from this week (loving these). Double exposures, pinks merging with reds, a bit of copper, blended technicolor-like images. They all seem to go together somehow. A bit of inspiration for a friday. 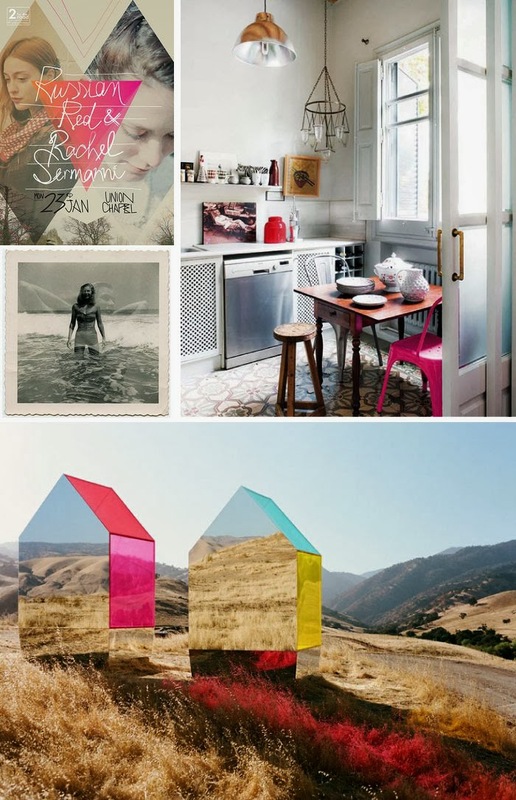 From the top: A pretty music poster —Russian Red, a bright pink chair in a cosy kitchen in Barcelona (images via Nuevo Estillo via Style Files), a beautiful landscape, Lighting Layers and Reflections (Autumn De Wilde), and a Double Exposure (unknown). Stay tuned for our latest lookbook and in the meantime check out our vendors at Poppytalk Handmade! i love those reflective houses! oh wow those mirrored building shapes are fabulous...so much inspiration! Thank again for all the leg work you do for us! the reflective houses are amazing, too! Lyndsay - yeah i know i felt the same way. The mirrored houses made me gasp. What a beautiful idea!